If you are looking for a sink that can bring style and elegance to your kitchen, the Anabelle Spot Resist is a good choice. It features the Spot Resist™ stainless finish, which defends the surface against water spots, fingerprints, and other smudges, allowing it to remain shiny and clean for a longer period of time, even if it is handled on a regular basis. The Anabelle Spot Resist has one handle for temperature adjustment. It’s very easy to adjust, moving at the slightest touch. Even with wet hands, you can get the water temperature you want right away. The Moen Reflex™ system makes the pull-down spray head easy to use, yet secures it to the gooseneck-style faucet well when it’s not in use. The sprayer also includes a push button control that will let you customize the water flow for your current needs. It offers the options of a mild aerated stream for basic cleaning, a strong flow to rinse away thicker debris, and a convenient pause function. The Anabelle Spot Resist model also includes a side dispenser for either hand soap or lotion. So, you don’t have to worry about having dry, cracked, or dirty hands after you do the dishes. Simply press the handle and use your soap or lotion of choice. 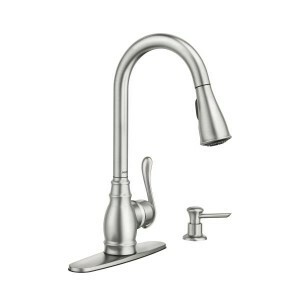 Click for more information on the Moen Anabelle Spot Resist Stainless Kitchen Faucet.